“With California mired in its worst drought on record, it was only a matter of time before something, or someone, sparked more fires in the tinder that now covers the state”, says Eric Zerkel of The Weather Channel. Now firefighters just hope that they can contain the latest round of blazes before more homes and livelihoods are lost. The Sand Fire, sparked July 25 by a vehicle that drove over dry brush, has already claimed 17 structures, including 10 homes, in an area to the east of Sacramento, California. The fire, fueled by hot, dry, windy conditions ballooned to around 4,000 acres and was 35 percent contained Sunday, in an area five miles north of the town of Plymouth, California, despite a show of force by firefighters. Nearly 1,500 firefighters, along with aircraft, battled the flames as they encroached upon the community of River Pines Estates in Amador County, California. More than 500 homes in the community were evacuated Saturday under the lingering threat from the fire. According to weather.com meteorologist Ari Sarsalari, the forecast might not help firefighters contain the inferno. 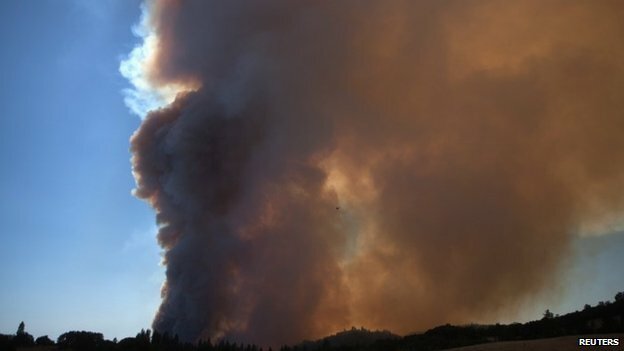 Another 200 people were evacuated in Yosemite National Park when a new fire developed Saturday afternoon, scorching 2,100-plus acres of terrain around the Foresta, California, community, the Fresno Bee reports. All 45 homes in Foresta were included within the evacuation order as the blaze moved northeast toward the community. The cause of the fire is under investigation. However, one resident in the area told the Fresno Bee that they heard “an electric line shorting” and shortly thereafter spotted the flames from the fire. Both fires come on the heels of the announcement of the full containment of the Bully Fire, which scorched more than 12,500 acres of Shasta County, California, land over a 15 day period. Earlier this year at least 10 wildfires broke out in the San Diego area, burning at least 47 homes along with businesses and an apartment complex. And with California’s record-setting drought only worsening and triple digit temperatures, more disastrous fires seem inevitable for the state.